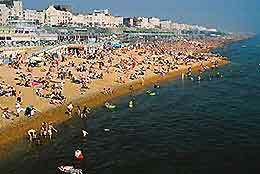 The Prince Regent put Brighton firmly on the map when he began visiting in the 18th century and sea bathing was proclaimed to be good for health. The seaside resort has remained in vogue ever since, with visitors flocking from near and far to take advantage of its myriad attractions. Often referred to as 'London-by-the sea', Brighton boasts many of the same allures as the UK's capital city possesses and more. Brighton's architecture makes the city an aesthete's dream, with a range of edifices from stately Regency homes and cosy seaside cottages to the Asian influenced Royal Pavilion. Situated on the south coast, the hilly city is also blessed with a fortuitous location and is surrounded by the beautiful South Downs, while also being less than an hour from London by train. An eclectic crowd of professionals, artists and a huge number of students make up Brighton's population, meaning there's an exciting art scene and unparalleled nightlife in this effervescent city. Open-minded Brighton also has a well-established gay and lesbian scene with many friendly clubs, pubs and hotels, not to mention plenty of trendy shops and restaurants to suit all budgets. Take a break from shopping and dining in the manicured gardens of Brighton's magnificent Royal Pavilion.